Nearly three years older than Miss Florence, the painter Carleton Wiggins (born John Carleton Wiggins), is shown standing in The Fox Chase rather than running. 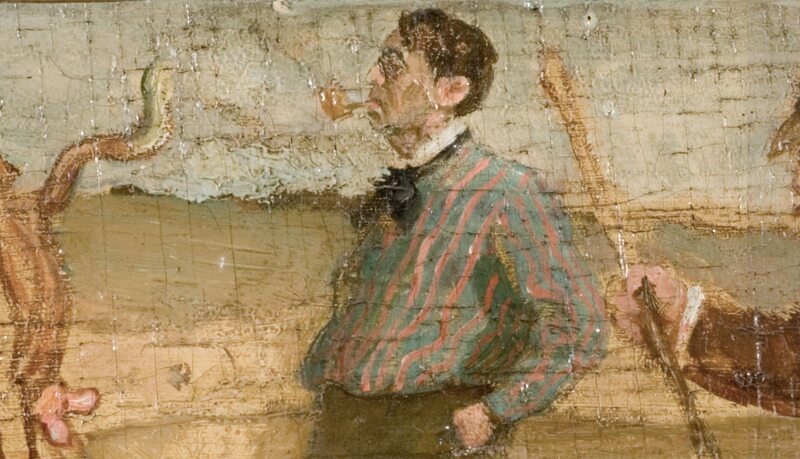 Fuzzy smoke rises from the pipe in his mouth as he abandons his panel of a cow in his paint box to watch his fellow artists running after the fox. A great fan of painting cows, Wiggins was, however, best known for his images of sheep grazing on a dark slope beneath moody skies — a version of which he painted on a panel for the Griswold boardinghouse dining room. The son of a tailor, Carlton left school at fifteen to work in a lawyer’s office on Wall Street in New York. When not engaged in errands or office tasks, he would fill the hours by drawing, often copying war pictures out of the illustrated papers. A wealthy client began buying his drawings and offered to pay for art lessons. Soon Carleton was studying art under the famous Tonalist painter George Inness, who was well known for his evocative landscapes. 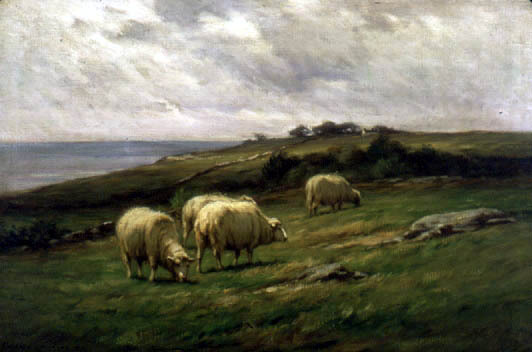 After working with Inness, Carleton continued to paint landscapes, but began to add animals, such as sheep. After getting married, he and his wife sailed for Paris, where he soon won a Gold Medal for his sheep-filled landscapes at the esteemed Paris Salon of 1894. For years the village of Old Lyme, Connecticut, has had a summer art colony of much note. This season the colony has been augmented by Mr. Carleton Wiggins, who has acquired a very picturesque place overlooking the Connecticut River and with a combination of scenic qualities which has fairly entitled it to its name of ‘River Wood. 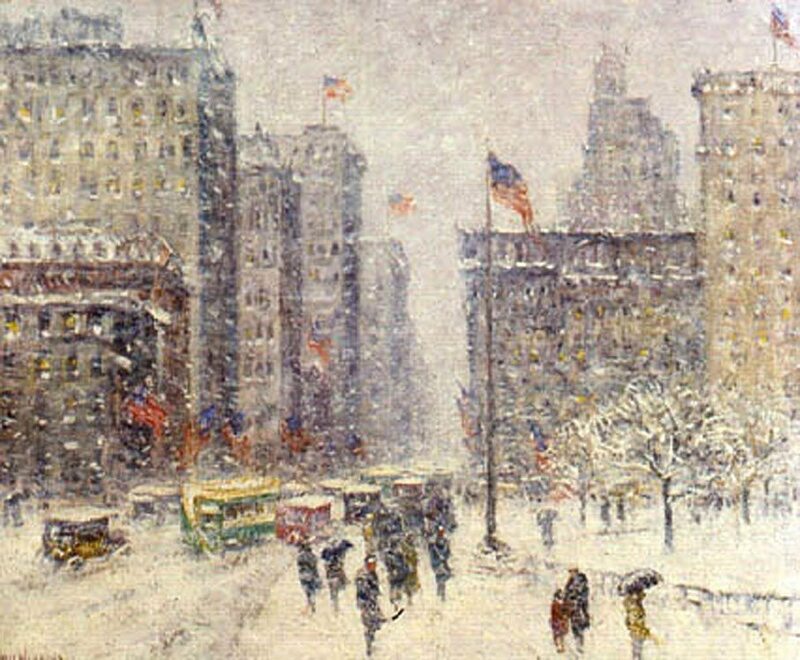 He continued to win awards for his paintings after he returned to the United States. While in New York, he most likely met Henry Ward Ranger and learned about the art colony in Old Lyme. He joined the colony in its fourth season in 1904, exhibited at their end-of-the-season exhibition held in the library, and bought a Victorian home nestled aside an orchard with a view of the Connecticut River. He named it River Wood. Carleton and his wife had four children. One of their two sons grew up to be a successful artist as well. 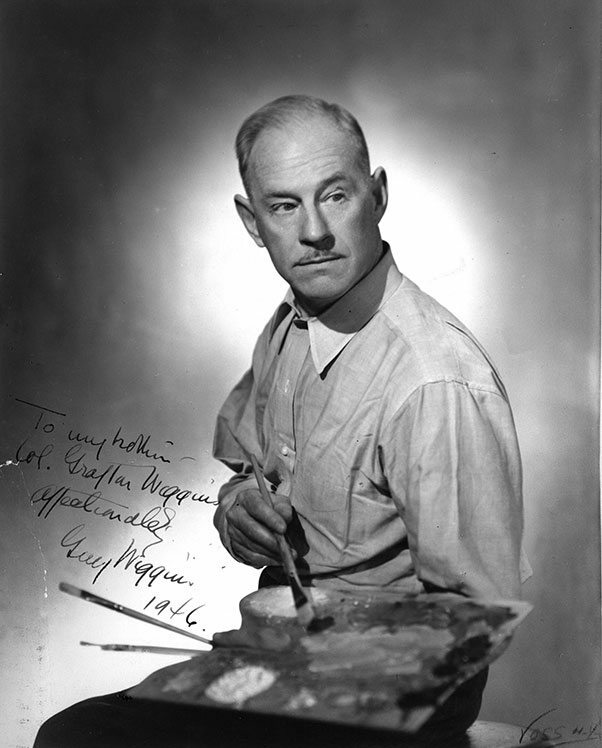 His name was Guy Carleton Wiggins (the father named his other son and one of his daughters after Grafton, the man who bought his first drawings and paid for his early art training). Unlike the father, however, the son’s impressionistic style was substantially influenced by the Lyme painters. Indeed, father and son differed in their subject matter as well. While Carleton continued to paint sentimental pastoral scenes of life on the small New England farm, his son’s fame was jettisoned by snowy canvases of the bustling flag-draped streets of New York City.